BAGAR, India, Jun 3 2009 (IPS) - What strikes a visitor entering the Source for Change business processing centre (BPO) in rural Rajasthan, a deeply conservative state where women are veiled and child marriage still rampant, is the near absence of men in the building. There are only rows of women to be seen behind computers that stretch from end-to-end of the single-storey house painted in green that has been transformed into the Source for Change office. BPOs are a 28 billion dollar industry in India, based mainly in cities like Bangalore. Source for Change has launched a social revolution in and around Bagar, a quiet town of some 10,000 people, some 600 kms north-west of New Delhi. Before it opened, educated girls here had only two options: work on farms or at home. 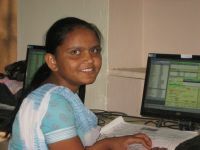 Now after two months of training, each employee is assigned independent data entry duties, the BPO’s main work for clients like the Piramal Group, a big Indian drugmaker, and Pratham, a Delhi-based non governmental organisation for children. Neelam Saini, 18, has been with Source for Change for 18 months. "I joined after class 10," she says. "We are four girls and two boys. I am the oldest. My father – a farmer – said he could not afford to educate us beyond class 10." IPS: Do you think the project is slowly improving gender equations in Bagar? AH: I don't believe that we've reached a threshold where we can say we have an impact on the entire town. However, I feel we are beginning to see signs of change in the households. By having a social network available at the workplace, the information asymmetry or lack of exposure outside the household for women is dissolving. This access to information is a building block toward empowerment. IPS: Do you think the associates are becoming more assertive and sure of what they want in life. AH: In a few cases, we have seen the associates have decision-making power in the household. Since the parents have allowed their daughters/daughters-in-law to join Source for Change, their reaction to this change is well received. Nobody has been pulled out for being too assertive. IPS: Does working at the BPO improve their marital prospects? AH: After speaking to some of the associates, the general consensus is that it comes down to which type of person their family prefers for them. In some cases, the guy will prefer someone who doesn't work, and in other cases someone who does work. Now a confident Saini says she intends to keep working and study further. "Earlier I used to feel that since I am 10th class pass there is nothing much that I can do. But after working here I feel I can do many things. I have filled the admission form for class 12, and intend to take that exam next year as a private student," she explains. Are her parents proud of her? They are "very proud of me," she says, a wide grin on her face. "Also," she adds in a serious voice, "because I am working my siblings will also be able to study further." The average salary is 4,000 rupees for an eight hour day. The BPO, an initiative of the Piramal Foundation, was set up in 2000 by three men: Shrot Katewa a biotechnologist from the University of Rajasthan, Alim Haji, an optical engineer from the University of New Mexico (U.S.) and Karthik Raman, a graduate in economics from Case Western Reserve University, U.S.
Only Katewa is a local person – from Bakhtawarpura, a small village near Bagar. However, unlike his co-founders he has previous experience working with BPOs having worked with two companies in Mumbai. Both Haji and Raman wound up in Bagar just by chance. The former "tired of my windowless office" in the U.S. decided he did not want to spend the rest of his life like that and found the Piramal Foundation on the internet. Raman has worked amongst tribal communities in the southern state of Tamil Nadu. The Piramal Foundation is supported by the family-run Piramal Group, a giant pharmaceutical company with a turnover of 5 billion dollars. The group’s early founders were born and brought up close to Bagar, and the Foundation is associated with many other projects in the area including the Bagar Employment Institute which runs courses in English-speaking and computer literacy. Sonam Jangir, 18, who is in the first year of an undergraduate programme, says she is the first woman from her village, Islampur, to have a job. "My parents asked me why did I want to work when no women in the family had ever worked? I told them this is an era of computers and it is essential to know computers," she says. She may have started a revolution in her village. "After I started working, five more girls from my village have got enrolled," she says with quiet satisfaction. The BPO states its mission is to address the serious problem of lack of job opportunities for educated women in rural India. As Katewa, one of the founders, puts it: "A major problem in this part of the country is that while women were being educated, they were married off and their potential was wasted. "We thought one of the ways to utilise their talent was to keep them here since the other constraint is that women are not allowed to move away from their homes in search of jobs," he adds. Initially the going was tough. There was stiff resistance from family members. "We had to convince the men in the household like the father-in-law, brother, father, husband that this was something they should let their daughter-in-law, daughter, sister do," says Haji. "On the first day of training, there was a crowd of men outside the office," he recalls. "They wanted to check out the place and us, whether their women were safe or not!" Now Source for Change has expansion plans and intends to increase its employers in Bagar to 100 associates by January 2010. There are plans also to create a network of offices that will be spread across Rajasthan, each employing between 100 and 150 women. With new clients like the Rajasthan government and the Confederation of Indian Industry, the biggest business association in the country with 7,500 members, the BPO can afford to make new plans. In Bagar, its youngest employees are 18 and the oldest, Sunita, is 30. For Sunita Chowdhary, the BPO has been a life-saver. "My husband is not working," she confides. "Because of this job, I am able to educate our two children." For Saini too, her life has changed. "Earlier I was very quiet and never voiced my opinions," she introspects. "But now I feel confident to say what I am feeling. My parents were asking me to get married and I told them, I don’t want to for another four years. I want to work for Source for Change!"